Hello, my name is Hiromi Fukuzaki and I am a senior majoring in Biochemistry and Molecular & Cellular Biology. Biochemistry Club has been one of my extracurriculars since my Freshman year at the UofA. I have held the Media Director position, as well as the Vice President position last year. Being the Media Director and Vice President have taught me a lot about the other officers as well as the work required to run this club. I think Biochemistry club has a lot to offer. I have participated in Biochem hosted events such as BECUR and Tucson Festival of Books (TFOB). Also, I am currently an officer for Women in Medicine in Science (WIMS). Therefore I do understand what it is like to be part of something larger than yourself. Communication and coordination is imperative for success and having worked alongside the previous officers as well as meet most of the members allows me to confidently say that cooperation will not be a problem as your President this year. My name is Madeline Morrow and I am a junior majoring in Biochemistry and French, with a minor in MCB, and a student in the Honors College. This is my third year being a member of the Biochemistry Club, and my second as an officer, as I previously worked as the Social & Outreach Chair for our club. Outside of Biochemistry Club and my studies, I'm a student ambassador for the Chemistry & Biochemistry Department, as well as a peer mentor. I hope to one day get into medical school to become a pediatrician. I'm so excited for our work this year with the club in planning BECUR and our community outreach projects and hope that we can further expand our work! 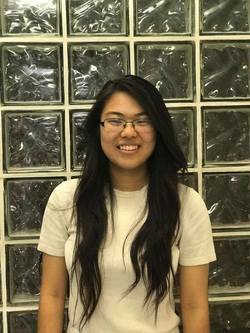 Hi my name is Emma Wu and I am the current Treasurer of the Biochemistry Club. I am a junior studying MCB with a minor in Biochemistry here at the UofA, hoping to pursue a career in pharmacy. I grew up in Glendale, Arizona, but my family is from Hong Kong. Some of my hobbies include hiking, meditating, napping, and watching Netflix. Hi there, my name is Haley Krouskop and I'm the current Secretary of the Biochemistry Club. I am a junior studying Biochemistry and Sociology here at the UA, and I hope to go into medicine after graduation. I currently work as an undergraduate research assistant in the Barnes Lab studying the effects of aging on cognition and memory. I grew up in Pinetop-Lakeside, Arizona, which is a really small town about four hours north of Tucson. In my very limited free time, I really enjoy spending time with my cat Evie, cooking, sleeping, and hanging out with my friends. Hey, I'm Bassil. I am a sophomore student in Neuroscience and Cognitive Science, with a minor in Biochem. I'm currently the social and outreach chair. Long term, I hope to get an MD/PhD in neurology and biomedical engineering. I am also in an ECE/BME lab researching new tools for the visually impaired. In my free time I like to hike and work with nonprofits. Hello! My name is Joseph Thonhoff, and I am the Biochemistry Club's media director. I am in charge of managing various social medias and designing event flyers and posters! As a sophomore at the university, I am a biochemistry major. I lived in San Tan Valley, AZ for the majority of my childhood, and I have family in Colorado and Oklahoma. I enjoy video editing, designing, attending music events, and experiencing the outdoors. During my freshman year, I joined the Biochemistry Club along with a handful of others, and I only hope to see the roster grow as I near my senior year!